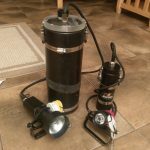 In this article I am going to make an attempt to tackle the subject of proper dive planning while using a DPV when cave diving. I am writing this article to try and dispel some myths that continue to permeate around the cave diving community, as well as try to make the reader consider things that may not have been covered in previous training. In this article I will give guidance on issues that should be considered in DPV dive planning that may have been overlooked in other formats. I need to be clear on one point: this article is not meant as a replacement for formal DPV Cave Pilot training, but instead it should be viewed as supplemental material to a formal class. To that end, I will not be covering emergency scenarios, such as sharing gas or how to tow a disabled diver. I also realize some individuals may find the tone of this article as blunt, and some may even take offense at the words written within. If you find yourself offended by the discussion below, or you find that the recommendations I suggest are overly onerous, perhaps you need to make a careful self-evaluation and re-think whether DPV cave diving is an activity that you are mature enough to engage in. 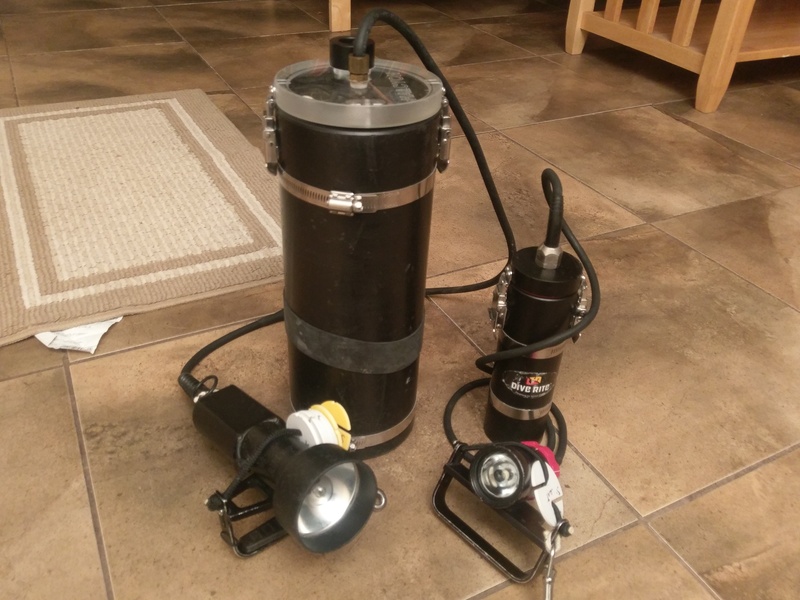 I want to start off this discussion by shooting a hole through one of the largest misconceptions about DPV cave diving: to be safe while riding a DPV in a cave, you always need to have twice the amount of gas required to swim out from your furthest point of penetration. The thought process behind this rule is simple – scooters are devices that may become disabled for any of a number of reasons; blades on a prop can break, electronic control systems can fail, o-ring seals can fail, etc. Based on this wrong mindset you need to be prepared to swim out of the cave when (not if) your scooter dies at the maximum point of penetration. The way that dive planning is presented in this model is that a diver swimming at approximately 50 feet per minute with a surface air consumption rate of approximately 0.75ft3 per minute, will need to keep approximately 250ft3 of gas in reserve for a dive to 2200’ at an average depth of 90’. Mathematically, this can be shown by knowing some basic formulas which are used to calculate (a) the amount of gas a diver uses in any given minute at depth and (b) the amount of time it will take to swim a given distance. With these two pieces of information, we can then calculate (c) the amount of gas the diver will need to keep in reserve. Please see the appendix below for an explanation of the mathematics. While this sounds great on paper and is probably suitable for planning a scooter ride to the Hinkle in Devil’s Ear, it is my belief that this method of planning a DPV cave dive is overly simplistic and may lead people to think that their safety is ensured simply by bringing twice the amount of gas they require to swim out. The challenge is that this model breaks down rapidly once the DPV pilot ventures beyond the simple confines of relatively shallow caves and short penetrations. Let me first explain how this approach fails on a deep dive. A deep DPV cave dive that many people have done involves scootering upstream Eagle’s Nest to King’s Challenge and The Green Room, a distance of roughly 2200’ from the exit. The dive usually has a round-trip bottom time of less than 30 minutes with a total run-time of around two hours. However, any diver that attempts to swim out from The Green Room will find that with little flow, such a swim will likely take 60 to 70 minutes and during that exit the diver will consume roughly 400ft3 of gas. This means any diver using the “always carry twice the gas to swim” approach should carry 800ft3 of reserve gas for such an exit, a ludicrous amount that can only be met with a full set of double 104’s and 6 stage bottles. Additionally, with an average depth of 240’, such a swim is likely to increase the mandatory decompression obligation incurred by the diver by 4 or 5 hours! Woe is the diver that added 5 hours to their decompression obligation but failed to add several hours-worth of emergency decompression gas. Because of the absurd amount of reserve gas needed and the increased decompression obligation such a swim would incur, clearly the strategy that to be safe you only need twice your swim out gas will not work on this deep dive. Now let me shoot a hole through this same approach on a long-range scooter dive in a relatively shallow cave. Several modern scooters allow a diver to go 8, 9, or 10,000’ into a cave (and out!) with no problems and any person that has the financial means to drop between $5k to $10k can own one. Isn’t technology great? 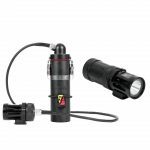 With an average depth of 85’ and literally miles of trunk passage, Manatee Springs beckons the person who just bought the new Zoom Zoom Extreme model DPV, which is rated by the manufacturer to go 20,000’ of travel distance. Carry enough stage bottles, point the scooter in the right direction, and whoosh you’re heading off two miles away from Catfish Hotel. Now imagine this scenario, you are 10,000’ back and the electronics package in the Zoom Zoom Extreme scooter dies, rendering it non-functional. Thankfully, Manatee has a lot of flow and it may be possible to exceed a swim speed of 50 feet per minute and potentially even swim as fast as 60 or even 70 feet per minute. While swimming out may sound easy enough, even at the ridiculously fast pace of 70 feet per minute, it will take you close to 2.5 hours to swim out of the cave. Let me repeat that for emphasis. Assuming you are able to sustain a maximal effort and swim at a pace of 70 feet per minute, it will take you over 2.5 hours to swim out from 10,000’ in Manatee springs. I want every person that is reading this article to stop for a minute and conduct an honest self-assessment. How many of you can truly say that you have the physical fitness and stamina to sustain a maximal effort swim for 2.5 hours? I didn’t think so. If you are not regularly engaging in cardio workouts that last more than two-hours at a crack, the likelihood that you will be able to swim out from 10,000’ is NIL. In addition to the physical demands such a swim will place on your body, you will also go through over 400 cubic feet of gas during that swim (a set of 104s plus 5 stage bottles). Some of you may be thinking “well, we could get a tow from our buddy!” The reality is that towing a buddy over a distance of 10,000’ is going to be challenging in the best of conditions. Add in the complexities of a cave with a large amount of vertical change and many restrictions along the way, and you may quickly realize getting a tow from 10,000’ is not a viable option either. 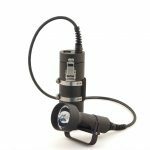 So how do we make DPV cave diving truly safe? This may sound a little uncomfortable, but DPV cave dives will always carry an element of risk and they will never be 100% “safe.” However, we can minimize our risks and make DPV cave diving safer by recognizing that swimming out of a cave should never be part of your dive plan and thus we should plan our dives appropriately. The first element of proper DPV dive planning is knowing the true capabilities of your scooter and not exceeding them. 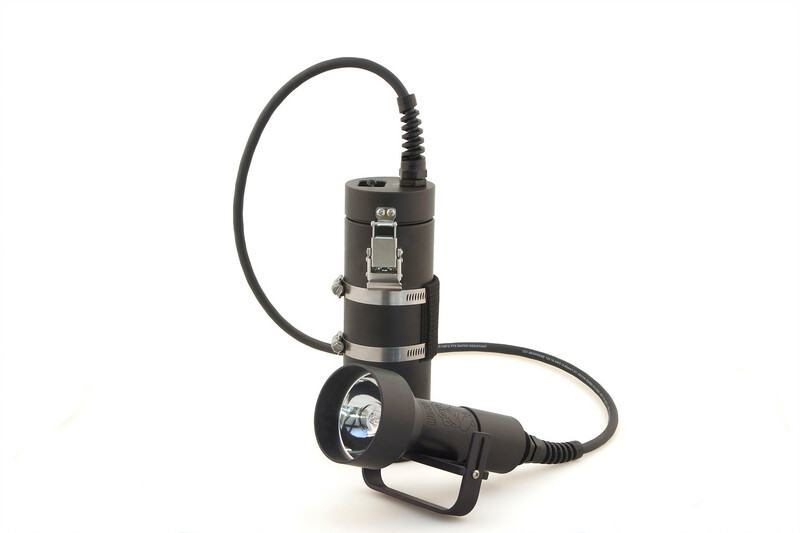 Just as no one in their right mind would consider entering a cave without a working pressure gauge or knowing how much gas is in their tanks, only a fool would begin a long or deep DPV cave dive without knowing how far their scooter can safely travel round-trip. To know how far your scooter can safely travel, you need two pieces of information: how much energy your scooter uses under maximal work (LOAD) and how much energy your batteries can currently store (CAPACITY). Finding out this information involves conducting some tests on the motor and periodically burn-testing the batteries. I cannot understate this, periodically burn-testing your batteries is very important for safe DPV cave diving. As batteries age, they lose their capacity to store energy and their effectiveness diminishes. A battery that held 1000W of capacity when it left the factory may only be able to hold 860W two years later and you would need to limit your dive plans accordingly. The prudent DPV pilot that regularly pushes their scooter close to its limits will burn-test their batteries at least once a year. Armed with the knowledge of how many watts your battery pack can hold and the load your scooter generates, you can get an idea of its real range. A battery pack that holds 860 watts of energy will realistically last for 170 minutes in a DPV that consumes 300Wh under load. If you know your scooter batteries will only last for 170 minutes, then hopefully you realize that you cannot ride that scooter into a cave for 150 minutes and expect a positive outcome when you turn to exit – you will come up short and kill your battery on your way out. You should never plan a dive that uses all of your battery capacity, planning a dive that kills your battery leaves you with zero safety margin and risks damaging the battery too! Usually, I try to plan my dives so that I use no more than 70% of my battery life for the entire time I am on the trigger. This leaves me with a little bit of extra capacity in the event I need to tow extra equipment, or for brief periods, a buddy. Planning to use no more than 70% of the capacity also minimizes the risk of harming the battery. There are several things that may impact how I distribute the time between penetration and exit. 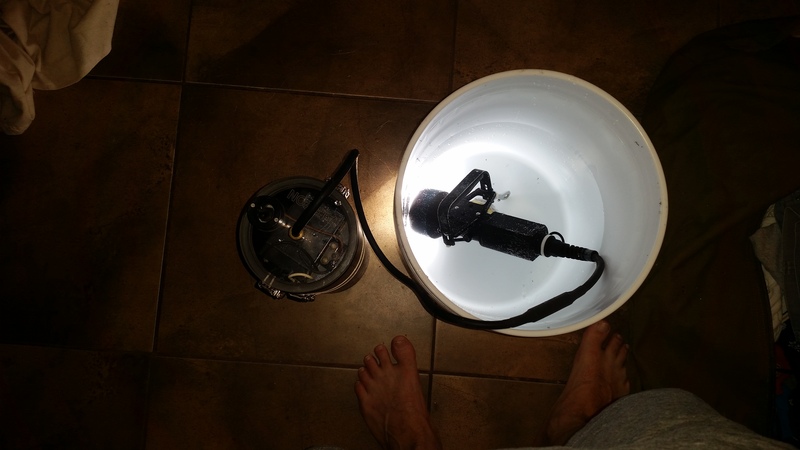 Factors I consider include diving in a siphon versus a spring, the amount of flow in the system, and how much additional equipment I will be carrying. Generally speaking, as a starting point you can split the time in half whenever you are diving into a spring. This means that if you have a battery pack that can run for 170 minutes and plan to use 70% of the capacity, you can use the scooter for 60 minutes while going in and 60 minutes while exiting. 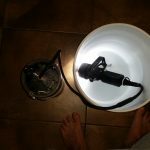 That covers staying within the true capabilities of your scooter, but now let me discuss the second thing we can do to make DPV cave diving safer. 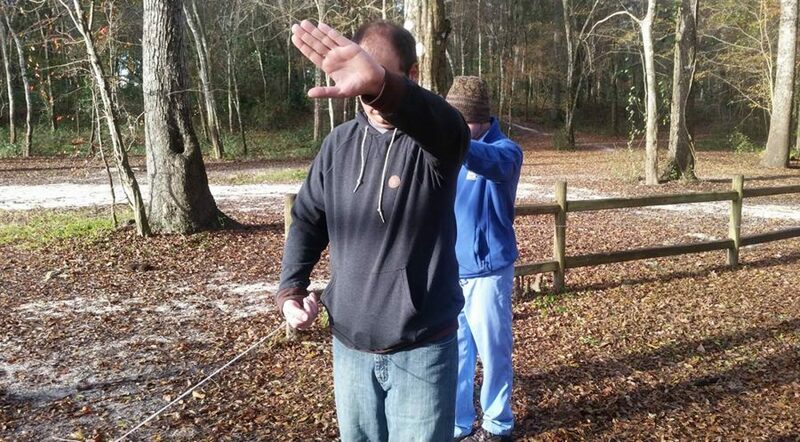 While hitching a tow from a buddy may be sufficient for a short penetration in a shallow cave, it is not a realistic option for a long or deep cave dive. This means you need to bring spare scooters whenever you either go deep or go long, and only you can decide when spare scooters become a part of the dive plan. Let me be clear on this point, every individual that is engaged in cave diving has to be a responsible adult that makes their own decisions on where the threshold is when “buddy tow” ceases to become an option and “spare scooter” becomes mandatory. However, I would suggest that any time that you are going deeper than 120’ or further than 3000’, that is when it becomes time to start packing a spare scooter. How many spare scooters a team brings will depend on the complexities of the dive and the capabilities of every member in the team. If you are not regularly practicing towing techniques, you should probably plan on bringing a spare scooter for each diver in the event you have two scooters that wind up becoming disabled. I know this part stings, because it means that now that you bought your Zoom Zoom Extreme DPV, if you have any intention of using your DPV to the limits of its capabilities you also need to have a second scooter as a backup. The good news is that you do not need to buy two Zoom Zoom Extreme DPV’s, but the bad news is your tow scooter better be reliable because it has to be more than sufficient to get you out from the furthest point of your dive. In conclusion, DPV cave diving is a lot of fun, but safe DPV cave diving is not as simple as carrying twice the amount of gas as needed to swim out. While swimming a DPV out or catching a tow from a buddy may be an acceptable answer for relatively short distances in shallow caves, that model breaks down rapidly once you start taking your scooter deep or taking it on long cave dives. If your dive plans include deep or long penetrations, you need to consider other options and give up the idea of swimming out. The purpose of this appendix is to try and help an individual understand the mathematics covered in the above article. In practice, the average experienced technical diver has a swimming SAC rate of 75ft3. If your SAC rate is unknown, you can probably use 0.75ft3 per minute as a starting point. The formula for converting the depth of the dive into pressure (ATA) is calculated with the formula ATA = (DEPTH ÷ 33) + 1. If we plug 90’ into our formula, (90 ÷ 33) + 1, we get an ATA of 3.7. Therefore our average experienced technical diver has an RMV of 2.8 cubic feet of gas per minute while swimming at a depth of 90’ (0.75 SAC * 3.7 ATA). This means that for every minute the diver is at 90’, he is using 2.8 cubic feet of gas. To figure out the amount of time it will take to swim a given distance involves knowing a realistic swim speed, as measured in feet per minute. Many things can impact your swim speed, including the amount of drag from the gear that you are carrying, the amount of flow either going with you (exiting a spring) or against you (exiting a siphon), and your stamina and cardiovascular fitness.Generally speaking, most technical divers should be able to sustain a swim speed of up to 50 feet per minute when exiting a high flow spring, but that rate may be reduced to as little as 30 feet (or less!) per minute in a low flow spring, and even less in a siphon. The formula for calculating the time it will take to swim a given distance is TIME = DISTANCE ÷ SWIM SPEED. A diver exiting a high flow cave, such as Devil’s Ear, from 2200’ of penetration can reasonably expect that swim to last almost 45 minutes (2200 ÷ 50) = 44. The formula for calculating the amount of gas needed to swim out from any given distance is GAS = RMV * TIME. This means our average technical diver will use approximately 125ft3 of gas to swim 2200’ out from a high flow cave (GAS = 2.8 cubic feet per minute RMV * 44 minutes TIME).Using our “twice the amount of gas needed to swim out” standard, the diver needs to carry 250ft3 of emergency reserve gas to be safe on the cave dive. 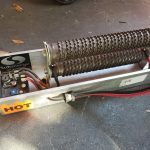 Calculating the load that your scooter generates may be a little tricky, as many manufacturers are not forthcoming with that data and there are many things that will impact the load a motor generates, such as drag and speed. However, one “hack” that many people have used is to begin with a fully charged scooter, ride it for 30 minutes on full, then recharge the battery while using a WattsUp meter to measure how many watts went back into the battery while recharging. You can then double that number to get the load in Watt-Hours (Wh).So, if your WattsUp meter records 150 watts when recharging a battery after you had ridden it for 30 minutes at full blast, then your scooter probably generates somewhere close to 300Wh of load on full. 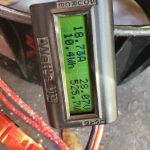 To perform a burn-test on your batteries, take a fully charged scooter and put a WattsUp meter in-line between the battery pack and a resistor pack. The WattsUp meter will display the watts consumed as the resistor pack drains the battery.Two pieces of warning! The first is you need to know what the low voltage cut-off threshold is for your battery pack and be prepared to remove the resistor pack before you hit that threshold, or you risk doing damage to the battery. The second is the resistor pack will get extremely hot while you are doing a burn test, you should conduct the burn test outside and away from flammable materials. Once you know how many watts your battery pack can hold, you can get an idea of real burn-time by using the formula HOURS = WATTS ÷ LOAD. You can multiple this result by 60 to calculate the number of minutes the scooter should be good for. So, a battery pack that holds 860 watts of energy will realistically last for 170 minutes in a DPV that has a motor that generates 300Wh of load, (860 ÷ 300) * 60 = 172. I never plan a dive to use more than 70% of the battery capacity. To calculate the dive plan upper limit, I use the formula TIME = REAL_BURN_TIME * 70%. So, if my battery is useful for 170 minutes, I would not plan a dive involving more than 120 minutes on the trigger. 172 * 70% = 120.